PhotoCards is a great app that lets you send real postcards to anyone’s home directly from your smart phone using your own pictures. 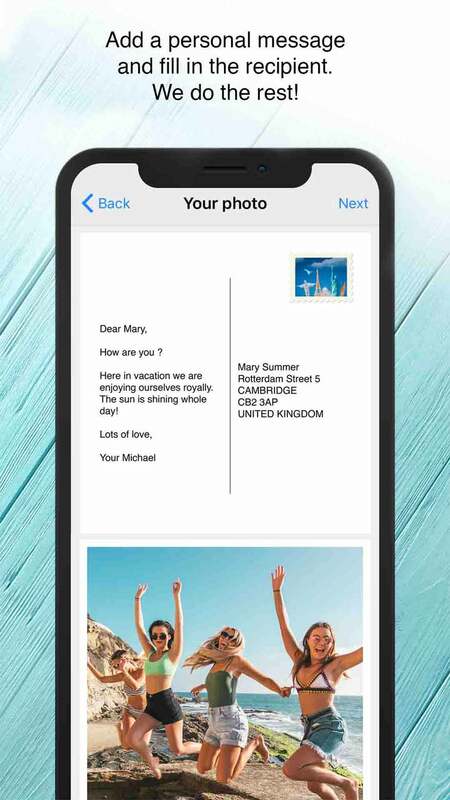 So now you can send postcards to family and friends from your vacation destination with a few clicks on your phone. It is quick, simple, and really fun. Then, Photocards will print your postcard in a square, old Polaroid format (5.91” x 5.91”), with your message on the back, and mail it to whoever you want directly to their home address. It’s just like you sent a traditional postcard, but you don’t have to spend time and money shopping for cards and stamps, and then mailing them yourself. 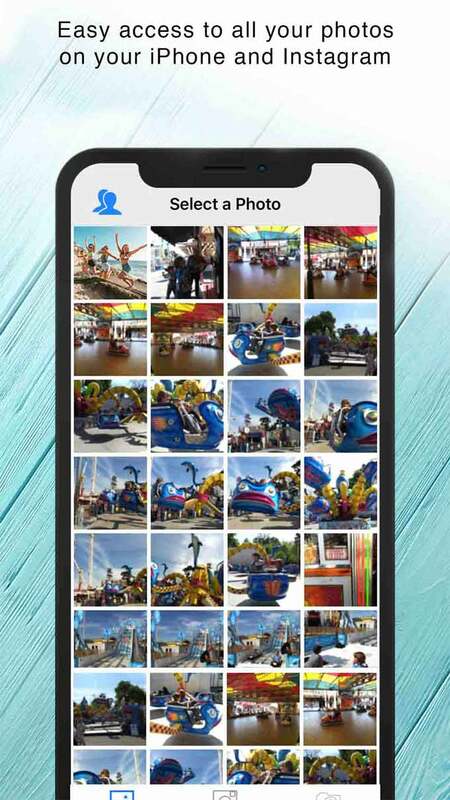 PhotoCards makes it quick and easy to include your family and friends in your vacation fun. PhotoCards is all about “Ease of use” and when traveling it’s a real time saver. PhotoCards is a fun, reliable way to share your vacation memories with all your loved ones. You can send your postcards from the beach, boat, amusement park, or anywhere. See below the additional benefits of PhotoCards. 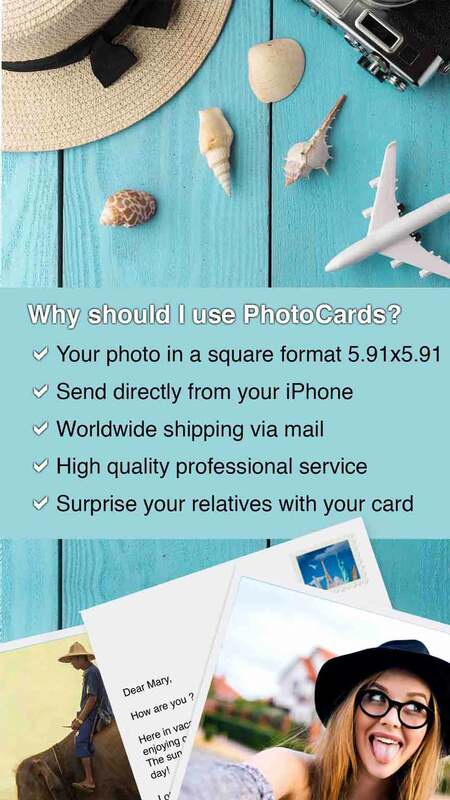 World Wide Shipping – PhotoCards can ship postcards from wherever you are to wherever your family and friends are. Fun old style postcard format – PhotoCards uses a square 5.91” x 5.91” format similar to older Polaroid style pictures. This adds a nostalgic touch to sending people postcards, an actual postcard that will get delivered right to their door at their home address. Add your message Just like on a traditional postcard – you can write a letter to the recipient of up to 750 words to let them know how your trip is going. Your letter will be put on the back of your PhotoCards postcard for them to read when it arrives. 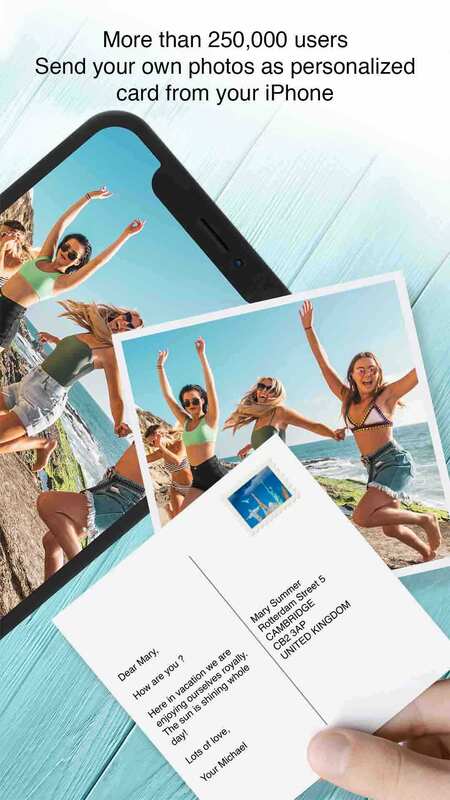 Chose your own photo for your postcard – It can be a scenic shot from your vacation, or a personal shot including you and your family or friends enjoying a day at the beach, the amusement park, or other tourist destination. PhotoCards is a fun, reliable way to share your vacation memories with all your loved ones. 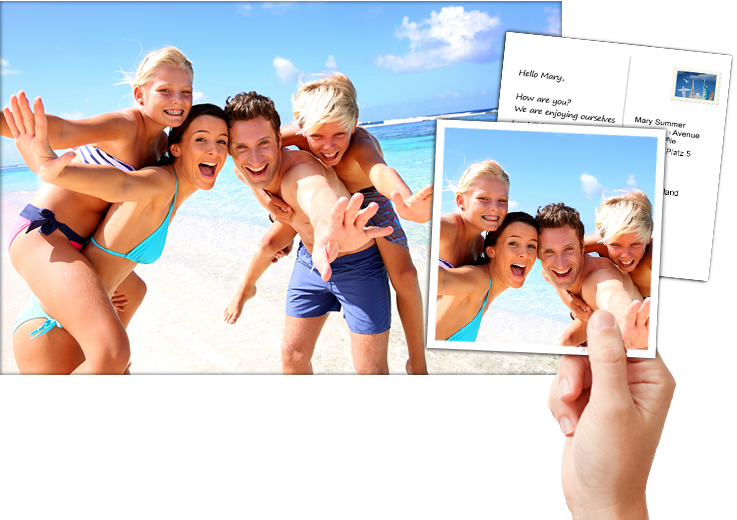 You can send your postcards from the beach, boat, amusement park, or anywhere else you are enjoying your vacation. Try using PhotoCards right away!